When you're away at college you should feel free to express yourself. And what better way to show off your unique personality and style than with your stylish dorm decor? It may look like a straightforward dorm headboard, but our DIY College Headboards have more to them than meets the eye. This must have dorm room headboard can be displayed as it is or you can choose to add fabric to this college headboard to better match your Twin XL bedding and dorm decor. Our DIY Dorm Headboards are also great for supporting you if you need to sit up on your Twin XL bed to study or just relax. 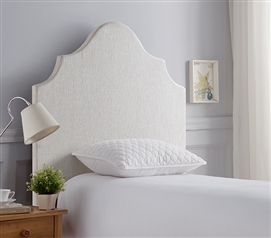 Made with comfortable thick plush foam batting, this essential Twin XL headboard will help support you when you don't feel like laying down. Wedge this exciting piece of Twin XL bedding and college decor in between your extra long Twin mattress and dorm bed bed frame or add on our DIY dorm room headboard legs for great support.